POSTED January 31, 2019 10:28 a.m. 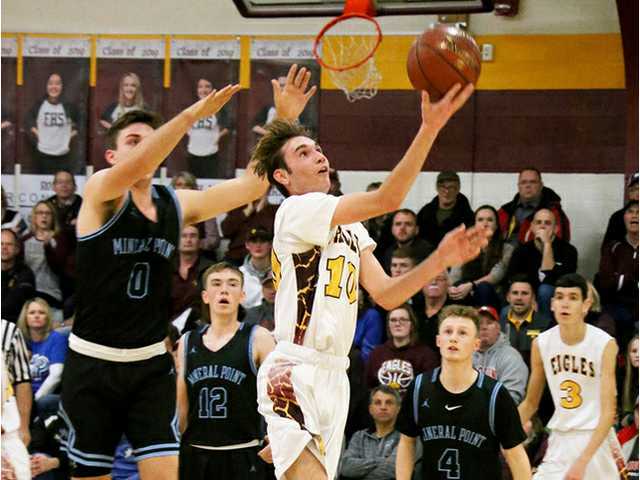 MINERAL POINT — With 1:07 left in the first half of Thursday’s Southwest Wisconsin Activities League showdown at Mineral Point, Fennimore senior captain and leading scorer Reid Larson was hit with a technical foul. Fennimore coach Troy Larson — Reid’s father — has a hard an fast rule on his team; you get a technical foul, you take a seat for the rest of the night. And coach Larson made no exceptions, not for his son, not even in the “big” game. Tenth-ranked Mineral Point was playing the without sophomore Division 1 recruit and leading scorer Brayden Dailey and his older brother senior starter Mason Dailey, who both quit the team two weeks ago following the blowup over an on-going internal team dispute. With one team in Thursday night’s high school drama seemingly falling apart in, another came together. Junior Kellen Kenney scored a game-high 23 points and senior Logan O’Brien played his best game of the season as Reid Larson rode the pine the final 19:07 to help Fennimore knock off the depleted Pointers 62–59. Fennimore (12–2, 6–2 SWAL) jumped out to an early lead using switching defenses as the revamped Pointers struggled to find a new offensive identity without the 6’5” Brayden Dailey, who was averaging nearly 21 points per game. Fennimore was able to hound the Pointers’ other D1 recruit, 6’3” senior guard Isaac Lindsey and force other players to pick up the scoring load. Larson’s layup gave the Eagles’ a 30–16 advantage with 1:07 left in the half, but he was whistled for a technical foul after yelling, “and one,” toward a referee after the play, insinuating he was fouled and the ref missed it. Point (9–5, 6–2) made both free throws and closed the game on an 8–0 run to make it 30–24 going into halftime. “Unfortunately, I had a bad feeling about this game and felt perhaps someone might cross the line,” said coach Larson. “I even mentioned it in the locker room before the game. So when it happened, I was obviously disappointed but not shocked. We are coaching kids, young adults. They will live and learn. I knew it was going to be an emotional game. Fennimore wanted it bad, but we can’t let emotions get the best of us. Fennimore clung to a slim lead much of the first half as the Pointers crept closer. Point finally grabbed its first — and only — lead of the game at 57–55 with 2:30 when Lindsey made three straight free throws after being fouled. Kephart was fouled on a putback on the ensuing possession and made the free throw to put Fennimore back in front, 58–57. Then, Fennimore's Warren Adam and Point's Wes Bergert traded baskets. Clinging to a 60–59 lead, the Fennimore defense held and O’Brien was fouled. He made both fouls shots — including one that banked in — to extend the lead to 62–59. Point again missed on its ensuing possession, but Kenney uncharacteristically missed a pair from the line with a chance to close out the win. The Pointers had one final chance to tie it, but a 3-pointer at the buzzer missed the mark. Kenney finished with a game-high 23 points, six assists, five steals and five rebounds to lead the victorious Eagles. “Kellen keeps defense on their heels all the time. He can handle the ball with quickness and has developed a nice jump shot and can get all the way to the hoop,” said coach Larson. O’Brien scored a career-high 11 points and grabbed six rebounds. Sophomore Adam Larson finished with 12 points, seven rebounds and two blocks. Kephart added seven points and held Lindsey to four made field goals and 15 points. Sophomore Warren Adam added four points off the bench. Reid Larson finished with a season-low five points. Sophomore Liam Stump led the Pointers with 17 points. Junior Wesley Berget added 15 points. Saturday afternoon, Fennimore defeated Iowa–Grant 77–64 in a SWAL afternoon. Reid Larson bounced back in a big way, making 7 of 9 3-point attempts en route to a game-high 32 points to lead the Eagles, who lead by as much as 25 points with six minutes to play. NEXT: Fennimore will now travel to SWAL-leading Darlington (14–0, 8–0) Friday night. The Golden Eagles will then host River Valley Monday night. Fennimore (12–2, 5–2) — Adam Larson 12, Reid Larson 5, Logan O’Brien 11, Kellen Kenney 23, Warren Adam 4, Derek Kephart 7. Totals — 25-55 8-12 62. Mineral Point (9–5, 6–2) — Wesley Berget 12, Isaac Lindsey 15, Blaise Watters 9, Garrett Wendhausen 6, Liam Stumpf 17. Totals – 22 7-7 59. 3-point goals — F: 4 (A. Larson 3, R. Larson 1), MP: 8 (Lindsey 2, Watters 1, Stumpf 5). Total fouls – F: 10, MP: 15. Fouled out – none. Iowa–Grant (4–10, 2–7) — Parker Velte 2, Issac Hill 15, Kruz Kitelinger 7, Michael Winders 11, Ethan Kuhls 2, Carter Grim 3, Dakota Kohlenberg 2, Kaden Paradis 3, Cobb Hubbard 19. Totals – 23-60 9-15 64. Fennimore (13–2, 6–2) — Adam Larson 19, Reid Larson 32, Logan O’Brien 2, Kellen Kenney 17, Jacob Young 6, Warren Adam 2. Totals — 29-63 12-13 78. 3-point goals — IG: 9 (Hill 4, Kitelinger 2, Winders 1, Grim 1, Paradis 1), F: 8 (A. Larson 1, R. Larson 7). Total fouls – IG: 12, F: 12. Fouled out – none.